If Florida is America’s Wang (According to the Homer Simpson - they prefer the “Sunshine State”, apparently) then Cabrillo is America’s Coccyx. Anatomically speaking. But in this case, there is no additional metaphor involved. Cabrillo is a nature reserve, military cemetery and celebrates the first European to set foot on Western American soil. On a clear day, unlike what we had, you get a good view of the airbase and of the spiky downtown area. At the heart of San Diego is Balbao park. It’s America's largest urban cultural park. Or so it ways on the web site. 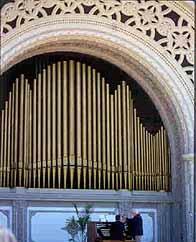 It has dozens of museums, historical buildings, friendship gardens, zoos, IMAX cinema, theatres and an organ pavillion. In the Museum of San Diego History there was a special exhibit celebrating San Diego in the movies. San Diego has a long history of being in the movies because it’s close to LA and has landscape and beaches and an airbase perfect for war films. Pretty much every major beach landing seems to have been recreated for the cinema on San Diego’s beaches. It was the home of the Top Gun academy at the time of the movie that made Tom Cruise what he is today (whatever that is). The exhibit also pointed out that hotel Del Coronado was used as the backdrop in Con Faldas Yo La Loco, better known as Some Like It Hot (see elsewhere) and the buildings in San Diego Park were used as the exteriors of Xanadu, the home of Citizen Kane. 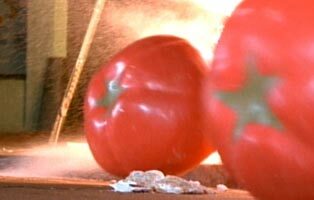 But most famous of all, it seems is the location for the whole of the Attack of the Killer Tomatoes series.